We are still hanging around up here in Maine and can you believe that I haven't taken a single photo for two days! I'm surrounded by such beautiful landscape and not a moment to pull the camera out. Bummer! Much of our day today was spent figuring out how to get our mail, newspapers and how to dispose of our trash and recyclables. We went to two post offices and finally one of them called us to tell us where our mailbox was located (a block away) and that newspapers are delivered to the mailbox, not to our front door. Ummmm, guess we won't have our paper to enjoy during morning breakfast. And as far as all the trash and recyclables, well, they must be broken down and divided into a number of different types of recyclables and taken to the waste management/recycling center. All so very different from city living! But I have no complaints. I feel these little inconveniences are a small price to pay to live in these surroundings. Everyone we have met has been so friendly and helpful. By the way, I think I may have confused a few of you with the idea that we have totally moved to Maine. Not true. We still reside in Philadelphia but hope to spend time up in Maine in the summers and occasionally throughout the year. And now, since I have nothing in my camera, I pulled some images from last week just before we left Philly. I was sitting in my office when I looked up and saw this magnificent creature! He was sitting right above my feeders. All the little birds had escaped. But he kept looking around. Lunch, I suppose. He eventually flew over to a patio chair and it was at that point I noticed a mourning dove sat frozen not but 8 feet away. He was sure to become lunch for the hawk but I quickly ran out and both birds flew away. Doves sure are sweet but man o man, not very bright! I hope to get out tomorrow and take some photos. The weather has been great! gorgeous coopers, reena! really perfect shots! Oh men, my heart has skipped a bit at these majestic photos, really!! And I see he has chosen yellow shoes to match his eyes! Great fashion sense, but not so sharp eyed, as he missed the dove! Perhaps he sensed you were there and was concerned about that. Philadelphia and Maine, could it GET ANY better??? I bet you have frequently had the best cheesesteaks ever! Is he beautiful or what? He certainly appears to be the master over his domain. Beautiful shots of the hawk. It's hard to imagine he came in so close. Our mourning doves are so intimidated by the Magpies, it's sad to watch. And by the way, your windows must be a LOT cleaner than mine! Perfection and to think he landed there. Im in aww. Your so lucky. Oh, Reena! What gorgeous captures of such an incredible bird! I, too, am in awe! Superb! I know you're going to love spending time in Maine! I know I would! Hope your week is going well! What a beautiful bird. Wonderful photos. As for the newspaper, may I suggest you just keep yesterday's paper for tomorrow morning's coffee. Yeah sure, you'll be a day late but you're in Maine...who cares? HI Renna...wow I am behind on your posts ..I just found out about you Maine spot...yah for you... I wouldn't want to be anywhere else!! I just love these shots of the Hawk..a real beauty...and I have saved many a dove from being lunch to they are not the smartest bird on the block lol!! Superb captures Reena. Excellent detail. 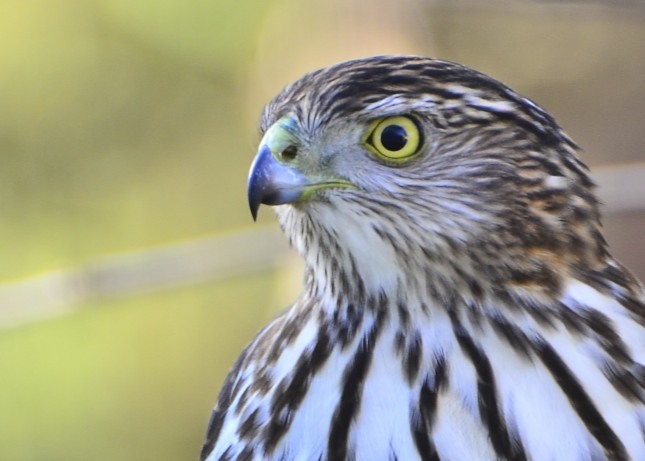 How do people get these pictures of birds of prey! The markings on this bird are amazing - I think he's saying he wants lunch! Wonderful shots! Hawks do not really like people, so there must be some attractive lunch options for him to hang around. Maybe he expecting a waiter? Haha ~ love the one of him sitting on the patio chair! Very sweet! Have fun on your photo shoot today! It is definitely hungry. And when they are hungry they don't care who sees them. Wow! What wonderful shots. You've managed to capture such detail on this magificient bird. Terrific! I would have run out to save the mourning dove, too! They are so beautiful, but not very quick in those dangerous times! Gorgeous photos. What stunning shots...I know what you mean, at least about the trash and mail. We get the paper only once a week, that was hard to take at first, and our trash we bring twice a month. We've really learned how to recycle. Look at those daggers! I'm sure happy all of the little ones ran :) Enjoy your stay up north! Beautiful close ups of a stunning bird!! Boom & Gary of the Vermilon River, Canada. Wow, great captures. I'm sure that dove was thanking you. Wow factor!. A beautiful series of the Hawk. That is a finest Bird of Prey that I have seen. Cheers Reena. I've always enjoyed watching hawks. I often spot them flying high overhead near Newton, MA, where I work. Occasionally, I see one land in a tree nearby, which is a rare treat. Wow! What a gift to have that amazing hawk pose for you. So beautiful also. Can't wait to see some Maine photos! It's a wonderful bird to see Reena..
glad we got to see this! 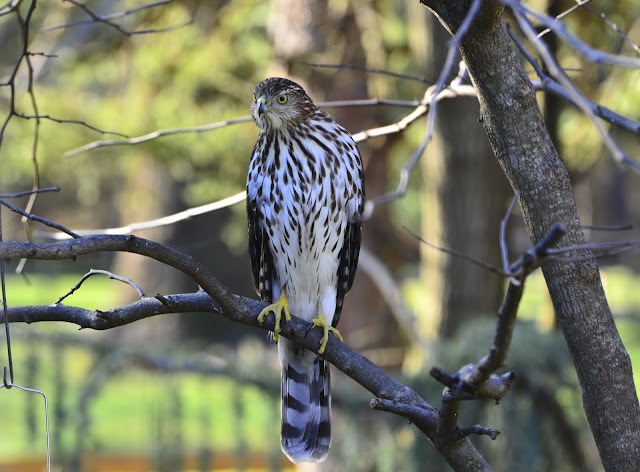 Over the summer I had a hawk right above my feeders. 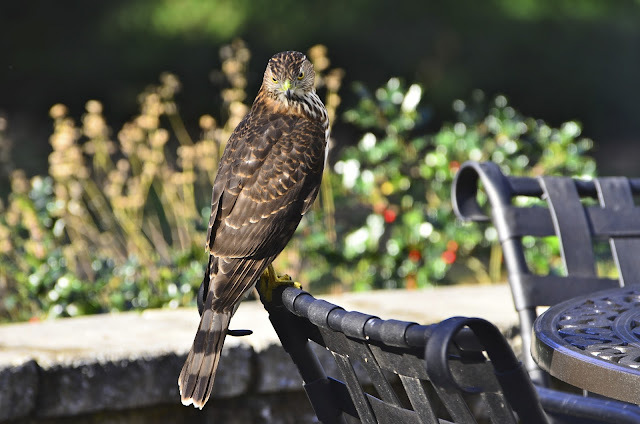 Good grief I know all of God's creatures have to eat but please Mr. Hawk not in my yard and not the birds at my feeder. 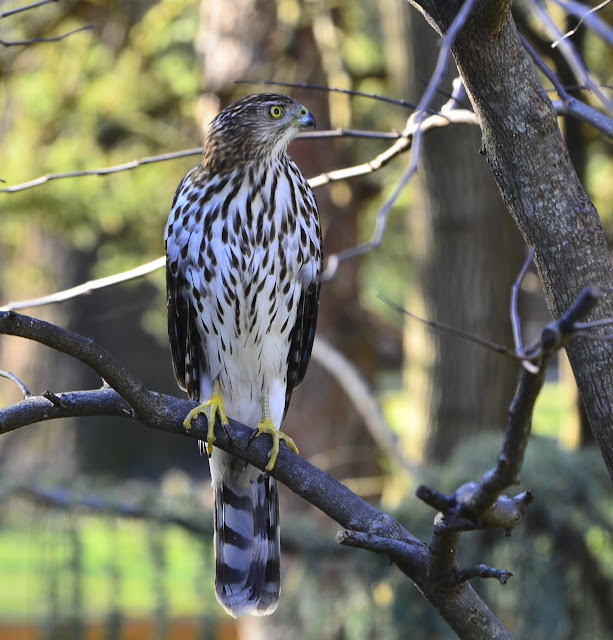 Often I struggle with the fact that my feeders are a buffet for the backyard birds but then the back yard birds are a buffet for the birds of prey. 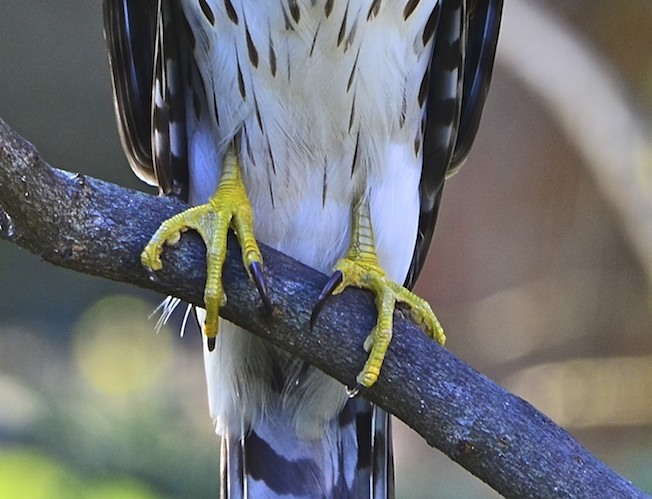 Absolutely gorgeous hawk. I had no idea the feet were so yellow. What an encounter, and to get such pictures with this kind of detail is remarkable indeed. What a gorgeous shot. They are just stunning..
Hope you enjoy your home away from home.. Sounds wonderful. Can't wait to see photos! That is a magnificent bird! I didn't want to be having a senior moment! Look at those claws on that beautiful bird. They could sure do some damage. It's a beauty,and your photos are terrific! Wonderful captures of this beautiful hawk! Holy smokes, the mailbox is a block away? That's certainly different. Keep on enjoying your staying in Maine! that bird is exquisite ! I was sent here by Ramblin' Kathy to check out your Key West photos as I have just recently started playing with Topaz. LOVELY! Boy, is that the kind of bird you get in the "city"? :-) And God bless you for saving that stupid dove. Great Shots! Especially the close up. I can't imagine having to go a block away to get my mail. I don't get a newspaper, I just read online, but I do get mail. I wouldn't want to feel his claws. But he looks so regal! 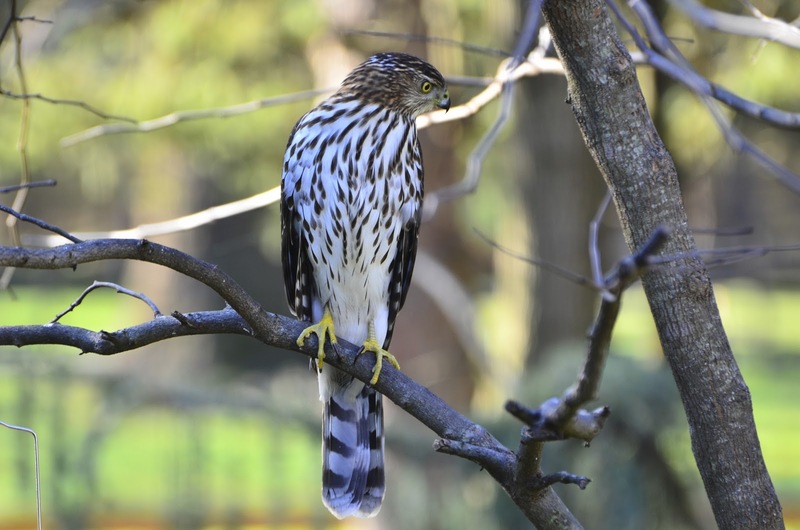 Reena, awesome shots of the Coopers hawk. It is a beauty, I am glad your little yard birds were smart and left. Awesome photos. Enjoy your time in Maine. A magnificent hawk! Great capture, Reena. What wonderful photographs these are Reena, and how fortunate you are to be spending time in Maine. It really is a most beautiful state, and truly a photographer's dream. Enjoy every moment! 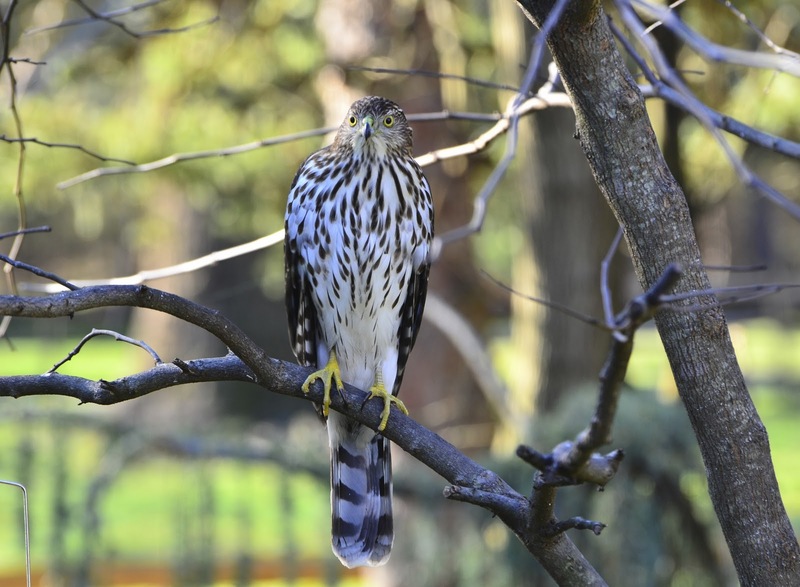 Wow wow wow - that hawk is magnificent! As are your photos. What a great series of pictures. What wonderful captures of this beautiful hawk! Great shot! The hawk is just drop-dead gorgeous; the dove too. You do have a soft heart, my dear, but you can't save em all. Mailbox a block away? Wow! Well, look at it this way - GREAT EXERCISE! LOL! Cheers!! Great shots of the hawk looking for lunch. Strange the dove would freeze like that.